Westy's Magical Mystery Tour – Adventures of a small man in a big world. 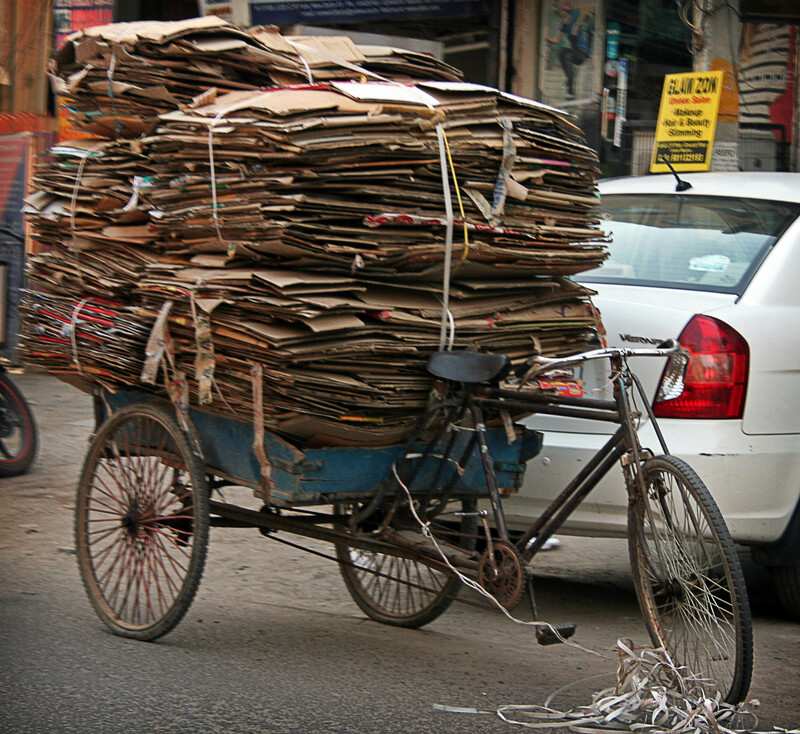 Every busy street, outside office blocks, by the side of markets, anywhere there are cycle-rickshaws, cycle-carts or just workers going to or coming home from work there are roadside cycle repair wallers. Plying their trade from early in the morning to late at night, rescuing unfortunate cyclists from the all to often hazard of punctures, broken wheels, snapped chains and the rest, the roads of Delhi being strew with deep potholes, debris and rubbish. They never seem to be idle and will even walk up the road, carrying their equipment of ancient stirrup pumps, old inner tubes for cutting patches and relics of tools to a stricken machine. For less than 100Rs or about a pound they will fix almost any problem with a cycle, keeping them on the road for as long as the frame holds out and even then a friend along the road will weld the the pieces back together so the life of many push-bikes and cycle-carts go on for years indeed a fifty year old or more cycle is not uncommon and new bikes seem to be rare. Many repair wallers will also fix punctures on auto-rickshaws, mopeds, motorcycles and cars, all by hand and often with the help of a young son learning the trade alongside their fathers. Some have lockers with many spares in and intricate, home-made tools while others just a bent piece of metal as a tyre lever, a pot of glue, a stirrup pump and a bowl of water, all providing an invaluable service to keep the wheels of commerce greased and inflated. Their pitches are often passed down through the family for generation after generation, amassing old spares and recycled parts, favoured tools gifted to the younger wallers, fast skills and tricks of the trade handed down to their apprentices. They do a valuable service for every community and no matter if the stranded cyclist has no money, just drop it in the next day as they pass. Often char wallers will set up shop next door to provide the waiting customers with tea, people in India never seem to miss an opportunity for a bit of trade, spotting a gap in the market and a chance to make a small living, even when a new road is built it’s not long before a repair waller will pitch-up and begin a brisk trade. It must be done, there is no choice, forms to fill, letters to print in triplicate only never used, everything including the kitchen sink’s details, signed, copied and reprinted. On-line form filled and printed, appointment given for 10.00am, arrive at correct time but appointments don’t exist, join the queue like everyone else. Identity photos to be stuck to every form. But where are the photos…missing from the bag, a rush out to a street vendor to have more photos taken by a ten year old boy and overcharged as they know it is urgent. The waiting at the government office, the FRRO, for ever and a day, The Foreigner Regional Registration Office. Shoulder to shoulder with Afghanis, Finnish, Americans, Canadians, Chinese, Tibetans, Africans from all countries, old hippies, young travellers, families, rich and poor, all waiting in line to present their forms. Everyone hopeful and hopeless too, will more paperwork be requested, will requests be granted, will it be done today, which counter do I stand at, which numbered queue is being called now. Beginning outside the office, a dirty, well- handled piece of paper to write names against numbers, waiting to be called out and given a torn scrap of paper with a number on to pass security to enter the office. Its chaos outside, a mellee of confused, bemused and desperate faces. Inside a concentrated, copy of the outside, noisy, hot, smelly, cramped, sweaty, confusing with many queues and counters and no instructions. Asking advice of an official, meets with derision and shouts to sit down and wait in turn, but when is the turn and for what is the turn for, should it be this queue or that queue, is time wasted when the proper action might be to just go to another counter. Number 44 is written on the scrap of paper, a stern official is calling out number 5, ten minutes later, number 6, another ten minutes, ‘Up to number 10’ is called. Oh… this is going to be long wait. Slowly the time sits like a rock in a stream, it will move but not if watched, only if ignored and looked at later. An hour slips by, number 40…41…42…43…stand up, ready for action, paperwork clutched, approach the gruff official, ignored, papers snatched, looked through, another number written on the form and a board of numbered lights pointed too, papers pushed back without a word. Oh…this IS going to be a long, long wait. In the hour waiting to be called up to the first desk the number board has moved from 16 to 20, a look at the number written on the from – 78! Sit in cramped seats, never enough leg room for people to squeeze by, watch the numbers flick painfully slowly onwards, half an hour they don’t change. Number 35 is reached when lunch time is called and all officials leave their posts and disappear. The cramped office thins a little, screaming babies are taken outside, shouting ceases for an hour, then as though a DVD on pause is started again, officials arrive back and mayhem begins again. Four and a half hours ooze past…72, 73, 74…75…76…77…stand, squeeze through the seated crowd, ready…78 to counter three. Ignored for five minutes by the stern, officious lady, papers snatched and looked through in detail…will they all be in order, nothing missing…they have been checked against the check-list countless times, they are all there but will fault be found? ‘You need a letter of request…Where is you letter of request?’ But what is a letter of request? ‘A letter asking that you be registered!’ Why do you think I have been here for 5 hours, for the flipping novelty of it? ‘You have to come back tomorrow with the right letters and forms and start again’ NOOOOOOOOOO! Right, use you best acting skills…drop head onto counter, moan a little, raise head and pleading face to over-officious lady, best begging voice…it does the trick. She smiles a little wry, sarcastic hint to it. Spoken to like a school boy in the heads office. ‘There is another way this can be done, if you promise to return within a week with the missing letter, I will grant you the Registered Foreigner certificate. No need to queue, just walk in and give it straight to me’. Result. Forms ticked and signed, another counter to go to, a bemused official as to what a request letter is but certificate is printed and handed over, the ‘In-charge’ desk is pointed too, the director has to put his signature to the certificate. The top man is also bemused as to what a request letter is, says its not needed but as its been asked for it has to be produced…then signs the certificate anyway. But where do you pay? Laughed at but this is light relief, this cost nothing, no charge for the certificate. So the check-list, the appointment and the costs stated on the website are all false and ignored by the office producing it. Smiling, clutching the Registered Foreigner Certificate, five and a half hours after entering back outside and homewards, hoping it will be easy returning with the requested request letter requesting to be registered even though already registered. A throw-back to colonial times when bureaucracy was taught by the British, now mastered by a modern India…in triplicate. Finally, after many pachyderm-less attempts, an encounter with an elephant. A lifelong wish fulfilled, curiosities answered, a powerfulness confirmed. Grey skin of two weeks’ stubbled old leather , thick yet loose, pliable yet firm. Ivory tusks as smooth as piano keys, hard and cool, a rock hard extension of the power and weight attached. Deep brown, amber eyes as large as a fist yet soft and unyielding of any thoughts behind. Beautiful, powerful, gentle with underlying forcefulness, strength felt in all movement, undefendable against. A tick-box filled, a memory cherished, afterwards a hand, unmistakably left with pungent odour, musky and like nothing to compare. A chat with the driver revealed this elephant the same, very one on a previous, disappointingly failed, attempt to meet, a three hour, fruitless journey to see only this time met within walking distance of home. 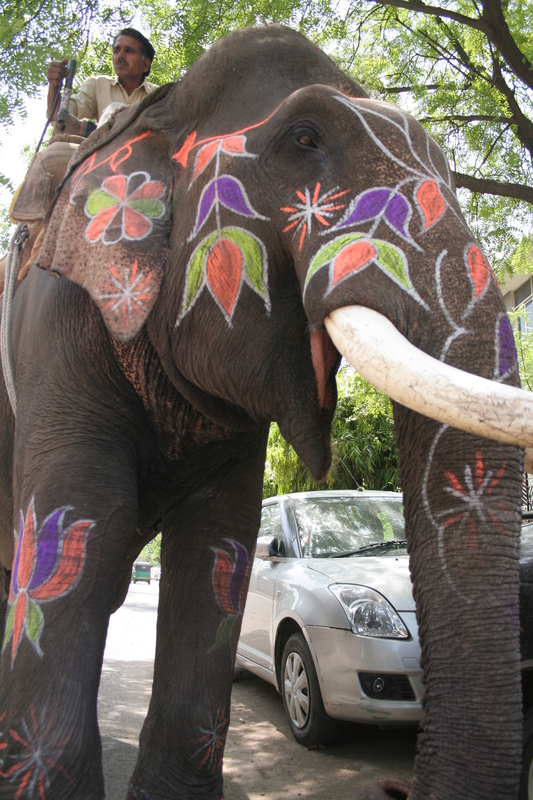 The smile was broad and the joy lingered long after, the elephant memory to be as long its own, much fabled. As a hundred Rupee note handed in thanks one, uncomfortable thought, such incredible beauty and strangeness didn’t evolve in the middle of a huge city. Celebrating Kali, Goddess of Time and Change, Annihilator of Evil. A 3,000 year old temple stuck between a rock and a hard place, Kalkaji Mandir surrounded by trappings of modernity. A six-lane highway and an overhead, concrete metro line frame the tiny temple against a backdrop of an ultra-modern, rich-sect’s massive, lotus shaped, steel and concrete temple that dominates the surroundings and visitors except when it is festival time. Thousands flock from hundreds of miles to visit the shrine to Kali, happy to finally reach their holy destination, excited laughter fills the air, shouts go up followed by all replying loud, joyous retorts as the tributaries of paths funnel devotees into one single, offering selling, market stall, lined avenue to be injected into the noisy throng at the temples base. Some groups carry huge flag poles wrapped in pennants, carried on foot the whole journey, others assist ultra pious, penitents hoping their ordeal will save or heal a loved one, traveling by lying fully prostrate upon the ground rising to take a step forward only to prostrate themselves again to kiss the ground. Each pathway towards the revered building are lined with stalls selling anything holy and the not so holy, garlands of flowers as offerings hang brightly from their roofs over trays of white sweets crawling with flies next to stalls of plastic toy guns and dolls. Gypsies trawl up and down, their heads adorned with baskets of the same, cheap, plastic toys while their children run up and down or stand and stare with dark, brooding eyes at the passers-by. A visible camera attracts the gypsy children, magnetised and smiling to have their picture taken and giggle at the image they are shown as if a magical game they play, encouraging brothers and sisters to join in the intense lens staring, laughing and shouting for more. Everyone must join in the pictorial fun, mothers are coerced to pose dismissively only to join the laughter in crowded views of a little screen, the game finally ended by shooing, grizzled grandmothers with teeth too long and patience thinned bringing decorum back to their ancient families, after all they a have a living to make. Out of her place but not out of her comfort zone. 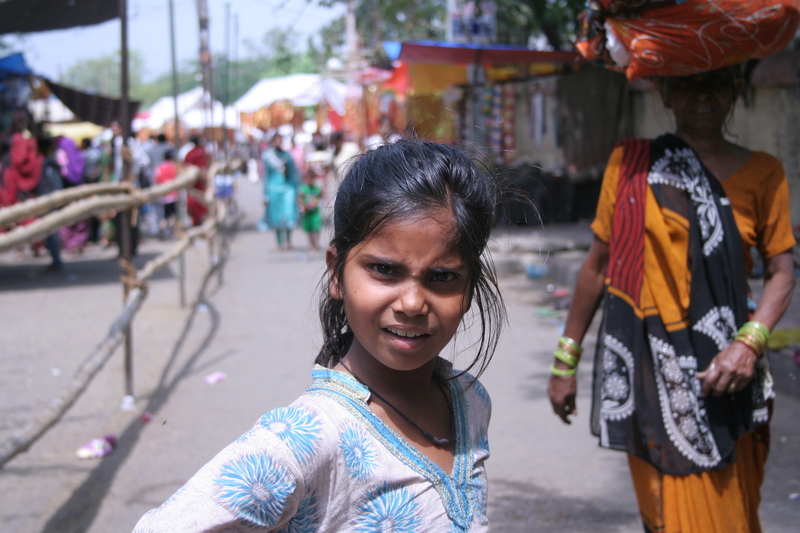 Preeti, a seventeen year old, young lady, was picked up from her one room slum shack, and taken to a five-star hotel to perform a dance for some visiting Europeans who are supporting Project Why, the charity school she attends. To get out of her home she has to walk on stepping stones forming a makeshift path through the overflowing effluent from a broken sewer. Sometimes the filthy water is so high it comes in through the door of her home meaning she can’t even get out because she can’t walk over it, she cannot stand on her legs. 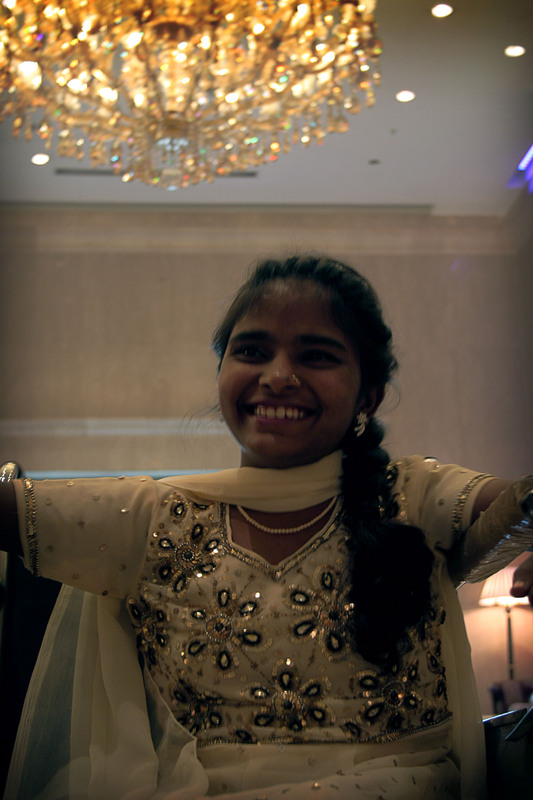 Since suffering polio at an early age her legs won’t support her weight, instead she shuffles along, sitting on her heals, using her hands to move her feet, she can get from one precisely placed stepping stone to the next, rarely if ever accepting help. Being in a five star hotel she completely took it into her stride, didn’t appear out of place nor looked round in awe at the plush surroundings and so make herself conspicuous, in fact she acted as she was there every day. After the dance performance, by the school, to loud and enthusiastic applause, the kids exited the room but where then invited back by the staff of the hotel to have breakfast from the buffet bar. Not only were the hotel staff generous in offering but in action too, serving the kids like they were the rich and affluent costumers of norm, not the slum kids they are and used to being treated as third rate citizens. Every child acted with politeness and manners even though excited by the opportunity to sample high-class food and so much of it as well, sometimes their families are too poor to provide breakfast at all and so arrive in class hungry, so this was a real treat for them. Preeti was served tea from a silver tray by a smartly dressed waiter, who placed the cup and saucer carefully down and withdrew discreetly as though serving a princess. To anyone watching they may have been mistaken for thinking she was some sort of VIP, the way she accepted being served without even the slightest hesitation or giggle nor so much as a flicker of the eyes as though this was a normal everyday occurrence. An hour later, changed into their normal, sometimes threadbare, clothes, all the children were back in class as though this had been a thoroughly normal day. They had acted with the pride they all have but, more notably, made all those who run the school very proud indeed, they were a credit to themselves, their families and the school. E-book of my previous blog about travels in India and working for an NGO, available on Amazon.